SPOKANE, Wash. – Students in the nutrition/exercise physiology program at Washington State University in Spokane are beginning their annual health and fitness clinic and need 30 volunteers to be their clients. The clinic begins Oct. 21 but later enrollments will be accepted. Clients are asked for a short time commitment each week. 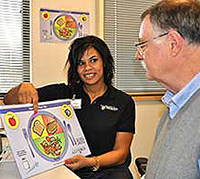 Volunteers may choose to receive free one-on-one counseling for lifestyle modifications, or participate in free group exercise or sign up for an evidence-based weight loss/increase physical activity known as the Group Lifestyle Balance™ program; this program has a one-time cost of $60, which covers all materials. Clients who sign up for one-on-one counseling will receive a program designed to meet their personal goals for creating a healthier lifestyle. This may include a dietary analysis or physical fitness assessments for flexibility, muscular fitness and exercise capacity. Clients will receive follow-up nutritional and/or physical activity education and counseling.